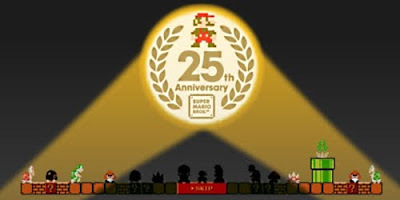 My latest post at PopMatters takes a look at Nintendo’s celebration of Super Mario’s 25th anniversary. I’m not quite sure what I was expecting, but the website itself seems fairly modest. Instead of a all-things-Mario extravaganza, it’s a fairly simple, classy look at the highlights of the series. I enjoy the fact that Nintendo publicly embraces the quirks and bugs that made the original Mario so fun to explore. Additionally, I appreciate their respect for technical mastery of a game. When the creator of a game posts speed runs, it almost feels like a challenge. Despite the huge universe spawned by Super Mario Bros., there’s no sign of go karts, golf clubs or stethoscopes; as far as Nintendo is concerned, the Super Mario franchise is defined by platformers. However, isn’t it strange that only select platformers get recognition? In seemingly playing favorites, it appears that Nintendo has its own idea of what makes a definitive Mario game. In celebrating Super Mario’s 25th anniversary, Nintendo seems to be suggesting an official canon for some of the most revered “texts” in the medium. I think it's interesting that, wherever possible, Nintendo represents Mario as "flying" and not just jumping. All of the images come from cover art, so this is not something new, but it's something I've never realized. I don't really think of Mario as a flier, but clearly he is, and clearly that's something that Nintendo has tried to suggest through their advertising. That was one of the things I had to cut out of the article, but I'm glad you noticed it as well. So much open, expressive body language. After playing Super Mario Bros. 3, I started to think about whether Mario's signature jumping was just a stepping stone towards flight!